Antioxidants and Multivitamins - Find the best multivitamins and antioxidants that nature has to offer, with Whole Food MultiVitamins made from organic plant sources. Whether you are looking for a sugar free powder drink mix featuring super fruit extracts, like NatureCity® ’s Trueberry7 Super Fruit Powder Mix, or a vitamin C capsule, you will find top quality products here. Augment your nutrition plan for weight loss, blood sugar support, bone health, brain & memory function, or circulation with antioxidants and multivitamins. Active Nutrition - The products in the NatureCity® catalog should be part of your effort to staying active and feeling your best, at any age. If you are trying to maintain healthy nitric oxide levels, the TrueNOx Nitric Oxide Drink Powder boosts blood flow, energy, while it promotes lean body mass and helps to reduce muscular fatigue. TrueC Organic Plant-based Vitamin C, TrueJoint FLX Joint and Muscle, TrueCoQ10, and TrueGreenTea with SOD, are all formulated to be an integral part of your active nutrition program. Women’s Health Supplements - Look good. Feel good. 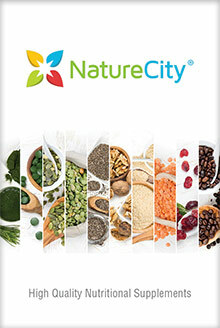 Save money with the NatureCity® coupon code. Choose the supplements, antioxidants, and multivitamins that are formulated with the same branded ingredients used in clinical trials. For women’s health concerns, the powder drink mixes, whole food multivitamins, TrueOsteo advanced bone support supplements, and TrueSlim weight management support, are specifically developed for a woman’s best health outcome. Men’s Health Supplements - A happier, healthier, and all around better life can be yours with men’s health products from the NatureCity® catalog. TrueProstate Advanced Support for Prostate & Urinary Healthy supplement combines cranberry extract, high selenium yeast, and pumpkin seed, as well as other quality ingredients, to improve physical health and urinary system function. Men will find that they feel the benefits of the True Whole Food MultiVitamin, TrueNOx Nitric Oxide Drink Powder, and the TrueMale supplement with LJ100 Support.